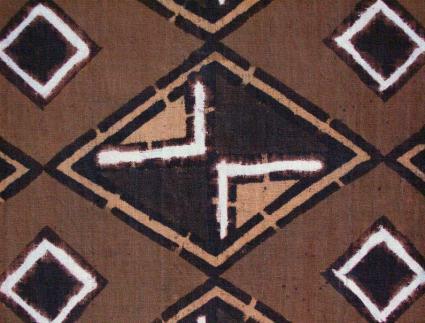 Bogolan, also known as bogolanfini, is an African textile whose distinctive technique and iconography have been adapted to diverse markets and materials. The textile is indigenous to Mali, where it has been made and worn for generations. The cloth's bold geometric patterns and rich earth tones make it distinctive and readily adaptable to new contexts. In the past, bogolan was made exclusively by women, who created it for use in specific ritual contexts. During the past two decades, new techniques, forms, and meanings have brought bogolan to international markets even as the cloth continues to be made and used in its original contexts. In North America, where the cloth's patterns have been adapted to a wide range of products, this textile is marketed as "mud cloth." Although bogolan is associated with a number of Malian ethnic groups, it is the Bamana version that has become best known outside of Mali. Bogolanfini is a Ba-mana word that describes this textile dyeing technique; bogo means "earth" or "mud," lan means "with" or "by means of," and fini means "cloth." Bogolan is unique both in technique and style, which makes the cloth particularly appealing to contemporary artists and designers. Many are also drawn to the fact that bogolan is uniquely Malian, made nowhere else in the world. Until its recent revival in urban Mali, bogolan was made only by women, who learned techniques and patterns from their mothers and other older female relatives. The making of bogolan requires both technical knowledge and mastery of the cloth's many symbols. Some bogolan artists become well-known in their communities and beyond. The recent rise in bogolan's popularity has changed the lives of some of these women, who now sell cloth to art collectors and teach aspiring bogolan artists, who are primarily young men from Bamako, the capital of Mali. The cloth's traditional uses reflect important aspects of Bamana social organization. Bogolan tunics are worn by hunters, a highly respected and powerful group for whom bogolan's earth tones serve as camouflage, ritual protection, as well as an immediately recognizable emblem of their occupation. The cloth is also present at important events in a woman's life. Bogolan wrappers are worn by girls following their initiation into adulthood, a process which includes female circumcision, and by women immediately following childbirth. The cloth is believed to have the power to absorb the dangerous forces released at these significant moments. Bogolan cloth is woven on narrow looms by men to create long strips of cotton fabric approximately six inches wide, which are stitched together to create wrapper-sized cloths (approximately a yard by five feet [1 by 1.5 m]). Production of dyes and decoration of the cloths is the work of women, who develop their skills over years of apprenticeship to their elders. The first and most essential step in the dyeing process is, paradoxically, invisible in the final product. Leaves from a tree called n'gallama are mashed and boiled or soaked to create a dye bath. After immersion in the dye bath, the now-yellow cloth is dried in the sun. Using a piece of metal or a stick, women paint designs in special mud that has been collected from riverbeds and fermented in clay jars for up to a year. A chemical reaction occurs between the mud and the n'gallamadyed cloth, so that after the mud is washed off, the black or brown design remains. The yellow tone of the n'gallama dye is then removed from the unpainted portions of the cloth: the undecorated parts of the fabric are treated with soap or bleach, restoring the white of the undyed cotton. The patterns that adorn the cloth are created by applying the dark mud around the motifs. This work is very difficult; every line, dot, and circle must be carefully outlined not once but several times in order to create a deep, rich color. The designs that adorn bogolan often carry a great deal of cultural significance. The symbols may refer to inanimate objects, to historical events, to mythological subjects, or to proverbs. One popular pattern refers to a famous nineteenth-century battle between a Malian warrior and the French colonial forces. Other patterns depict crocodiles, a significant animal in Bamana mythology, and talking drums used to spur Bamana warriors into battle. Artists may select from a wide variety of motifs, which they employ in various combinations to produce a single piece of cloth. Bogolan clothing, worn by Malians and non-Malians alike, is a common sight in urban streets, classrooms, and nightclubs. The cloth is prominent in Malian cinema and it is often worn by the country's musicians, many of whom tour internationally. Bogolan is used to make clothing in a wide range of styles, from miniskirts and fitted jackets to flowing robes in traditional styles. The designer Chris Seydou is credited with adapting the cloth to fashion in international styles, cultivating interest in this indigenous art form both in Mali and abroad. For some who wear it, bogolan clothing is an expression of national or ethnic identity. For others, the cloth is simply chic, a fashion statement rather than a political stance. Bogolan clothing is particularly popular among young people, who are often in the forefront of shifting fashions. Over the course of the past two decades, bogolan has become a symbol of Malian identity, appearing at government-sponsored events and in official publications. Outside Mali, bogolan is made into a variety of products that represent Mali or, more broadly, Africa. The cloth is particularly well suited to serve as a symbol; in addition to being uniquely Malian, bogolan's bold colors and patterns are readily recognizable. In addition, its important uses in traditional contexts appeal to Malian national pride and to foreigners interested in Malian culture. Today, the cloth is familiar to nearly all Malians; it is made and worn by people of all ethnicities and ages. In Mali, bogolan is associated with local cultures, part of the heritage of the artists who make it and the merchants who sell it. In the United States, where bogolan is also popular, the cloth is foreign, exotic. While in some contexts bogolan is marketed as a symbol of African American culture, in others the cloth is presented as vaguely "ethnic." See also African Textiles; Traditional Dress. ADEIAO. Bogolan et Arts Graphiques du Mali. Paris: ADEIAO et Musée des Arts Africains et Oceaniens, 1990. An introduction to the work of a cooperative group of artists who have adapted bogolan to contemporary studio art. Aherne, Tavy. Nakunte Diarra: A Bógólanfini Artist of the Beledougou. Bloomington: Indiana University Art Museum, 1992. A small but excellent exhibition catalog on the work of an important rural bogolan artist. Brett-Smith, Sarah. "Symbolic Blood: Cloth for Excised Women." RES 3 (Spring 1982): 15-31. An analysis of the role of bogolan in women's initiations. Imperato, Pascal James, and Marli Shamir. 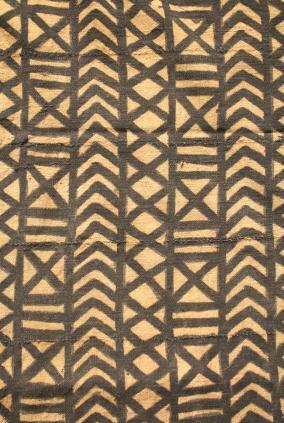 "Bokolanfini: Mud Cloth of the Bamana of Mali." African Arts 3, no. 4 (Summer 1970): 32-41, 80. An excellent and well-illustrated overview of bogolan in the Bamana heartland. Rovine, Victoria L. Bogolan: Shaping Culture Through Cloth in Contemporary Mali. Washington, D.C.: Smithsonian Institution Press, 2001. An exploration of bogolan's many contemporary forms and meanings in rural and urban Mali, as well as the cloth's international manifestations.